Dear Santa, I want it all! :) Hey friends and happy Thursday! Can y'all believe that we're only three sleeps away from Christmas Eve and only four away from Christmas?! This Christmas season as absolutely flown by. 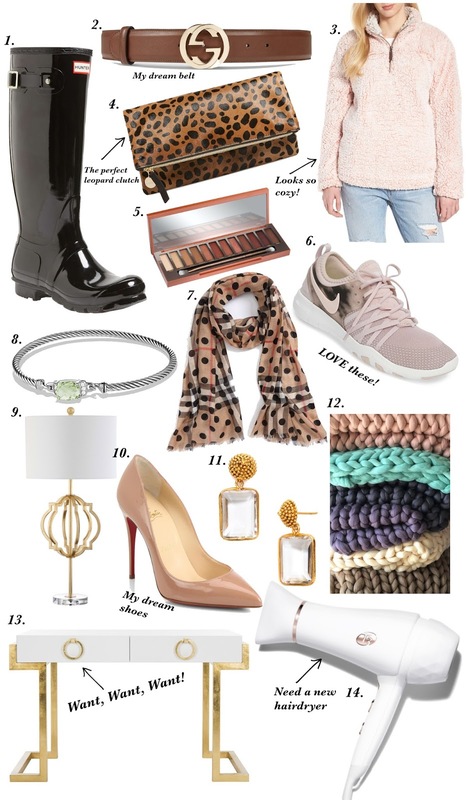 After sharing several gift guides with y'all this season, I thought it would be fun to do a little roundup of items that I'm wishing for (and dreaming of haha). I'll share a little bit about each of them next. I love my Hunter boots so much. They are definitely a closet staple. I've had many colors, but I've never had a black pair. I prefer the gloss over the matte finish. This black pair is currently 20% off! I may make these my Christmas gift to myself haha. This Gucci belt is my dream belt! I have a reversible Tory Burch belt that I absolutely love and wear all the time. But the Gicci one is definitely something I'd eventually love to have. I have heard so many great things about this cozy pullover and wold definitely love to have one for myself. This leopard clutch has been on my wishlist for forever, it seems. I love Clare V. pieces and know that I'd get a ton of use out of this clutch. Leopard is basically a neutral :) This eyeshadow palette looks amazing...I love a good warm palette. I immediately fell in love with these pink Nike training shoes. I mentioned this dot Burberry scarf in my post a few days back because it's probably the cutest one I've ever seen! My Mama and I both love it. I'm always down for a new piece of Yurman. I am in need of some new gold lamps for my nightstands and feel that this one would be perfect! When it comes to the perfect neutral pump, a pair of Louboutins are definitely my dream pair. There's just something about the classic red soles. These Julie Vos earrings are so gorgeous! I'm obsessed with this entire jewel tone collection. A chunky knit blanket has been on my list for a long time, but I could never justify paying the price for the full size. They're amazing, though! A new desk is probably at the top of my wish list. I absolutely love this one! My current hair dryer is starting to act a little wonky, and this T3 Featherweight Luxe 2i one is definitely the next one that I want to try! Not to mention, it's so pretty. Well, that's about it! A girl can dress, right? :) But in all honesty, I have to say that I'm most excited to see the joy on Madeline's face this Christmas. That in itself is enough for this mama. I hope y'all have a great Thursday! We're doing our annual family Santa night tonight. It's a tradition that we've been doing ever since my sister and I were little. I can't wait to see Madeline's excitement! We're currently making reindeer food in preparation for him to stop by. Reindeer for is simply oats, glitter and red and green sprinkles to sprinkle out for Santa's reindeer. Thanks for stopping by! I'd love to hear what y'all have on your wish list! I'd love to get a chunky knit blanket. They're so soft and look amazing layered on a bed. The pullover looks so cozy. I'd love to rock it all winter long.